Welcome to suburban life in 3003, after NuBioCom collapsed the biome in 2666 and destroyed the last of Earth's original animal species (and every DNA record needed to re-create them), replacing them with company-designed ""kritters."" Frek Huggins, the 12-year-old hero of this wry tale of cosmological hijinks from Rucker (Space Land), plays with his talking dog, Wow, argues with his sisters, forever resists his mom's attempts to get him to clean his room and daydreams of making it big someday as a toonsmith, the 31st-century equivalent of a video-game designer. Then Frek discovers the mysterious Anvil, a small UFO, hiding under his bed, and the toons on the wall start telling Frek he's going to save the world. 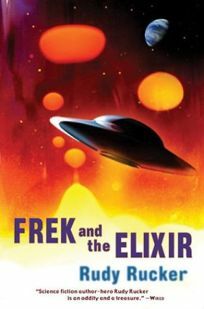 Certain that the Anvil has something to do with his missing father, Carb (a social misfit who ran away years earlier to Sick Hindu, a space colony on an asteroid), Frek manages to escape with the spaceship only to find himself caught up in an alien plan to market humanity's thoughts and experiences to the rest of the universe. Bent on rescuing his father, and Earth, from the machinations of a vast multidimensional and extraterrestrial entertainment machine, Frek has to rely on a little help from his friends. Rucker successfully combines sharp-edged satire with old-fashioned pulp sensibilities to create a frantic tale of dirty double-dealing and high adventure. Readers in search of something ""different"" need look no further than this droll saga of the future. (Apr. 10) FYI: Rucker's last book, As Above, So Below (2003), was a historical novel about the Flemish painter Peter Bruegel. .